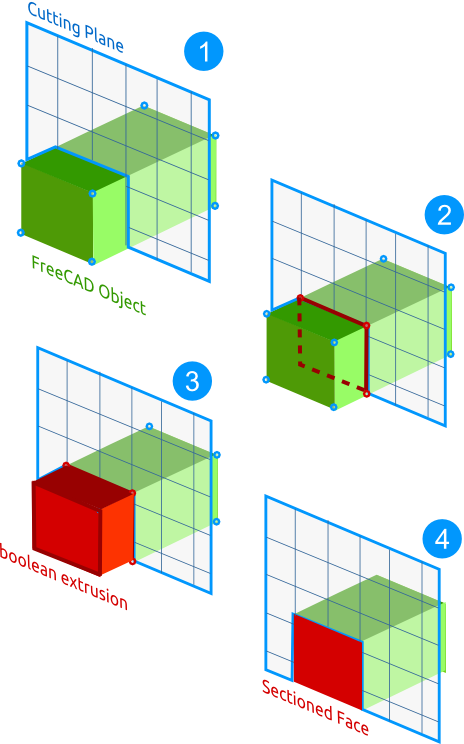 Mr Parry's blog on his FreeCAD development. The bounding box for the FreeCAD part is then projected onto the cutting plane - there are 8 points. The maximum size of each projection on the principal axes of the plane are found. These are then turned into an extruded box prism and a boolean cut operation leaves the remaining part. The remaining sectioned part remains. The faces are then projected and if they are coincident with the cutting plane it will be sectioned face. Interestingly enough I decided to mimic such behavior in the Sectioned View of this. Although relatively simple, in c++ requires finding the correct modeling algorithms in OpenCascade. After some mind boggling, I eventually got something crude to work. The functionality I am aiming towards is something similar to the functionality in other commercial CAD packages (namely Solidworks). My view is that using a 3D plane to section an object can be slightly tedious and awkward - atleast until we get a plane feature with the arrival on the Assembly Module. Instead I think it is more practical to create a section in the 2D Drawing User Interface. The user can create both 3D and Orthographic projections of the object and the user will 'draw' a section line AA in 2D. Upon completion this will create a new 'Section' View to the side that can be freely positioned. The section plane is calculated simply by taking the cross product of the current view normal and the line, which produces the new normal of the plane. This would hopefully cover most cases, but it should also allow an arbitrary plane to be set to create more flexibility when sectioning. The one complication that arises is that references will be lost because of the boolean operation. This will be of concern atleast until we get the more robust naming mechanism. Any sectioned faces or even chosen ones should be fillable with a hatch pattern. This can be detected automatically if the face is coincident on the plane. I haven't yet decided the approach for storing hatching information but should be relatively straight forward. Your idea to place a section plane in 2D is indeed much easier to use than my current 3D plane. And indeed it will cover 99% of the cases... Now I guess we'll really need to put some work in the Drawing module! I got the sectioning to work very crudely this afternoon, but is currently not at the correct angle. I think other CAD packages also allow you to set hatches for faces even if it's a section view. So yes, should be an exciting result if this works! If OCC is able to sort the projected faces, then definitely our major problem would be solved. Where did you find about that?